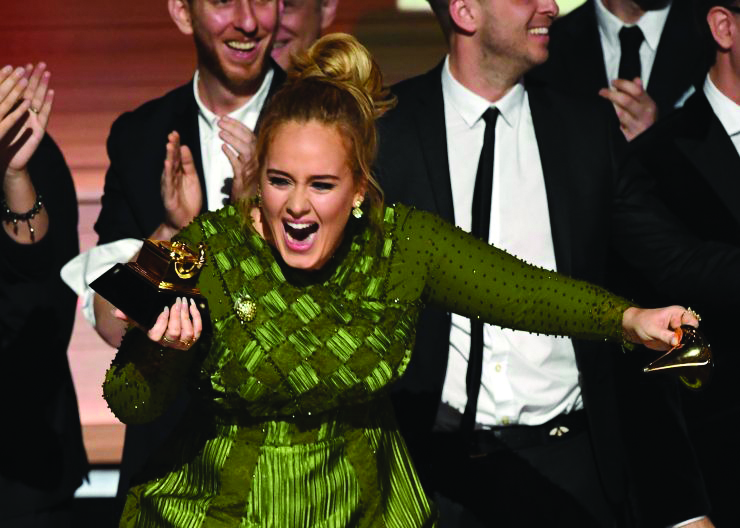 Full of phenomenal performances and unpredictable winners, the 59th Annual Grammy Music Awards took place Feb. 12. Adele kicked off the show with a breathtaking performance of her hit song “Hello.” After experiencing audio issues during her big performance at the show last year, she came back stronger than ever and started the night off on a great note. Although the British popstar had a bit of a mishap during her George Michaels tribute, it’s hard to deny that she had an incredible night. Moments after she began the song on the wrong key, she stopped and requested to start over explaining she couldn’t “mess this up for him.” It wasn’t looked down upon — essentially because she’s Adele, but also because she killed it with another accomplished performance. Another huge moment for Adele during this year’s Grammys show was when she graciously dedicated the album of the year award to Beyonce’s “Lemonade” rather than accepting it for herself. This alone exhibited how shocked she, like the rest of the world, was that “25” had taken the trophy over “Lemonade.” She expressed her gratitude towards all of the meaning behind Beyonce’s album and how important it was to her, while in tears and barely accepting the award. Other big winners of the night included David Bowie and Chance the Rapper. Bowie had only won a single Grammy while being alive, and yet was able to sweep four awards during this year’s ceremony. Although this was long overdue in many people’s opinions, I think we were all happy to see him receiving at least some of the recognition that he deserved before he passed this last year. Chance the Rapper, only 23 years old, made history at the Grammys this year by being the first artist to ever win an award having only released an album via streaming platforms. He took home three major awards — best rap song with “No Problem,” best rap album with “Coloring Book” and best new artist of 2017. After what has been quite an eventful year for our country, celebrities that appeared on the show didn’t fail to find ways to incorporate political moments. Jennifer Lopez, Katy Perry, Beyonce, A Tribe Called Quest and even Recording Academy President Neil Portnow were only some of the few that brought up political ideologies throughout the show. As you can probably guess, they were all not exactly in favor of our current president in the White House. Overall, it was quite an engaging night for the most part. Other performances included Ed Sheeran, Pentatonix, Bruno Mars, Katy Perry, Chance the Rapper, duets from Keith Urban and Carrie Underwood, John Legend and Cynthia Erivo, Alicia Keys and Maren Morris, The Weeknd and Daft Punk, and many more. There were a few dull moments during the show that seemed never-ending, but in general there was nothing I wouldn’t expect to see watching the Grammys.